The new Sunliner Habitat offers a quick getaway – in every sense. Sunliner is one manufacturer unafraid of pushing the boundaries. This long-established family business is set to release the all-new Habitat – a motorhome they say is a game changer – at the end of this month and gave RV Daily an exclusive first look. The Habitat is an upmarket and fully-featured motorhome designed to take you off the beaten track and then let you stay there longer than usual. Not a true off-roader, it’s best viewed as an all-road motorhome with some rough-terrain capabilities. 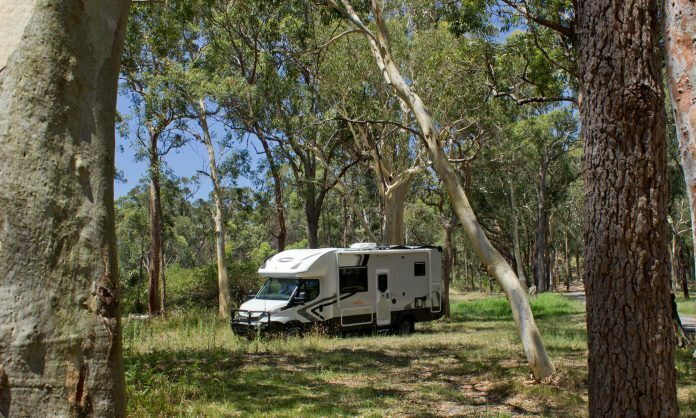 “We’re planning to launch the Habitat officially at the Victorian Camping, Caravan and Touring Supershow on the 22nd of February 2017. But we are happy to reveal that our four major considerations for the Habitat are the ability to get ‘off the grid’ for as long as possible; the types of terrain to be negotiated; storage capacity, and security while free camping,” Nick concluded. The Habitat presents a new approach to motorhome utility and design. Its military-grade appearance includes chequer plate lower body panelling, a black steel bullbar and heavy-duty rear bumper with high-mounted spare-wheel carrier, tubular steel sidesteps, BF Goodrich All-Terrain T/A tyres, roof-mounted LED light bars on both sides and at the rear (plus one on the bullbar), and bright orange stencil-style decals. There’s also a bullbar-mounted aerial for the UHF CB and a dash-cam as standard equipment. The Habitat rides on the latest Iveco Daily 70C170 cab-chassis, with a 7000 kg GVM derated to 6500 kg (perhaps due to the tyres), but which still leaves a generous 1500 kg payload capacity. Just be aware you’ll need a Light Rigid (LR) licence to drive this vehicle. Although it might appear otherwise there is no suspension lift; any increase in the Iveco’s already good ground clearance comes from the all-terrain tyres. This Daily comes with a 3.0-litre four-cylinder single-turbo-diesel producing 125 kW and 430 Nm. It drives through an eight-speed fully automatic gearbox and importantly, comes with the optional differential lock. On the road this drivetrain combination is one of the best, providing super-smooth progress that makes the best of the engine’s wide torque band. And despite what you might think, the BF Goodrich All Terrains are quiet on bitumen and grip well in the wet – something I know from many years using them as my 4WD tyres-of-choice. On dirt roads and bush tracks the combination of quality tyres and decent ground clearance should be sufficient for most situations, while the auto and diff-lock are especially well suited to soft/slippery conditions. Remember, this is still a 2WD vehicle so be careful if you venture into the rough stuff. Venturing, however, is what the Habitat is all about. For starters it has a huge 210 litre fuel tank (think easy 1000-plus km range), 400 litres of fresh water and enough electrical oomph for you to become a remote power station: 300 amp-hours of house battery capacity backed by 300 watts of solar, with a 2.9 kW petrol generator added for good measure. And if you need to run your hairdryer and Nespresso machine, the 3000-watt inverter will let you do both – at the same time! Sunliner reckons the capacities provide for at least five days of self-sufficient camping. Depending where you’re parked, however, the surprisingly small 100-litre grey water tank will be the limiting factor if you can’t legally dump it. Ditto with the 19-litre toilet cassette. The Habitat has considerable external storage by way of a full-width rear boot that has a floor-to-ceiling section on the driver’s side said to be ideal for snow skis, fishing rods or even a surfboard. The boot is also pressurised via a fan to minimise dust ingress. Sunliner says it has identified security as a matter of serious concern to customers who free camp. While a motorhome provides significant advantages over other RV types in this regard due to being able to jump into the cab and drive off, in a first the Habitat takes things further. Much further. It comes with a new Quick Evacuation mode that at the touch of a button turns on the LED flood lights, raises the rear stabiliser legs, retracts the electric awning and entry steps, and let’s you hit the road in around 90 seconds. Very clever. It also includes lockable water and generator fuel fillers, a security entry door and high-set windows. The Habitat is a four-seat, four-berth motorhome with swivelling cab seats, two long front lounges that double as single beds – the main bed lowers from the roof – a mid kitchen and entry door, and a full-width bathroom across the back. While certainly not ‘tough’ inside, the military-grade theme continues with satin finishes designed to reduce dust appearance, plus things like satin-finished black taps and shower fittings (except the external shower, which oddly is a chrome domestic-style unit cleverly mounted inside a swing-open locker door). The rest of the decor is stylishly muted in a mix of earthy tones to reinforce the Habitat’s ‘serious’ nature, but with enough highlights to reflect the model’s actual upmarket positioning and inclusions. The L-shaped kitchen is a good size while the choice of a big 190-litre, two-door 12 V fridge/freezer is an excellent one, doing away with the hassles of LPG operation associated with traditional three-way units. It also means much longer intervals between fills for the two 4 kg gas cylinders that now only have to look after the cooking, as hot water comes from a diesel-fired heater that draws fuel from the Iveco’s tank. The same unit also provides central heating when off grid, although you can also fire up the rooftop reverse-cycle aircon as an alternative (and of course, for cooling in summer). A well-proportioned removable table provides good dining space and can be left in place when you lower the roof bed, should there just be two of you onboard. The electrically-lowered roof bed is 1.83 m x 1.83 m, which is bang-on six feet in the old language and a bit short for some people these days. Likewise the single beds are 1.83 m long, but 0.70 m wide. At the very rear, the bathroom is a good size and comes with a large, separate shower cubicle. Additionally, across the rear wall are deep mirror-fronted cupboards with shelves and a half-height wardrobe. Overall, internal storage is a bit limited due to the drop-down bed but should be fine for most buyers. Sunliner’s new Habitat is an innovative concept that’s well executed and sure to be a winner. It’s don’t-mess-with-me attitude is backed by considerable abilities yet softened by more than enough luxury. It’s also the first serious entrant in a new motorhome class that’s certain to become hugely popular. Watch for the Habitat’s debut on the Sunliner stand in Melbourne on February 22.